Jack's Northern Pacific Fishing Adventure! One-way, in-country flight from Tamarindo to San Jose for departure flight back to US. Day 1 - Welcome to Costa Rica! : We were met at the Liberia International Airport, in the north of the country, and transported by a private van to the Flamingo Marina Resort, just outside of Tamarindo on the northern Pacific coast. The hotel was on a bluff overlooking the ocean and marina, and had a big pool, a restaurant, a poolside bar and patio dining. We were in a deluxe double room with two double beds. Breakfast was included each morning and because we arrived early in the morning out afternoon was free to explore town and relax. 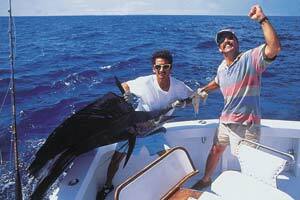 Days 2, 3 and 4 - Deep Sea Fishing: We fished all three days on a new 30-foot charter boat. We had an experienced and friendly captain and mate. Lunch and beverages were on board and the fishing was good. Day 5 - Free Day: This day was free for the beach, snorkeling, sea kayaking, mountain bike or beach buggy rentals, nature tours and more. Day 6 - More Deep Sea Fishing: We fished a fourth and final day with the same great boat and captain. This day we decided to troll the shoreline for smaller species like roosterfish. Day 7 - Another Free Day: After a relaxing breakfast, we spent the day trekking through the lush rainforests of Santa Rosa National Park. Day 8 - Departure: We were transported to the airstrip in Tamarindo for our short flight back to San Jose. After we landed, we boarded our flight to the States.